For all day energy, look no further than a simple B12 shot to give you the vitality and stamina to power through your day. B12 is a powerhouse vitamin that is administered monthly. 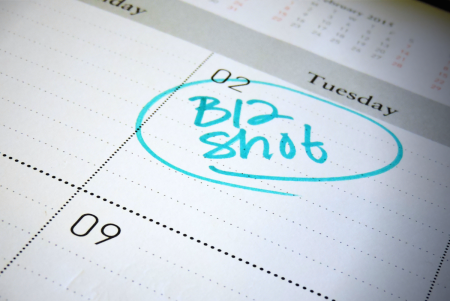 Many people notice greater benefits from B12 shots than from pills. Plus, you leave behind the burden of remembering to take a vitamin everyday! B12 plays a key role in proper brain and nervous system function, adequate blood formation, adrenal function, and key metabolic processes. This super B-vitamin increases energy, mental clarity, and mood stability all while improving symptoms of fatigue, allergies, and depression. If you don’t get an adequate amount of B12, you may feel sluggish, lethargic, or depressed. You may even suffer from vision problems, low sperm count, memory loss, and severe allergies. People with diets low in meat commonly do not get enough B12. We offer B12 shots in our office or at your health fair. It is recommended that you get a B12 shot every 3 to 4 weeks to maintain the benefits. In fact, you’ll likely notice when it’s time for your next shot. And for more energy boosting benefits, try our B1 and B6 shots. These nutritious vitamins aid in all things energy. The most common forms are B1, B6, and B12. At Cover-Tek we offer all three. No appointments are necessary. Just pop on in. Oh wait, you want us to come to your office? We can do that. Let’s talk. B12 stabilizes your mood to beat stress and symptoms of depression, all the while benefiting overall vitality. These nutritious vitamins also aid in all things energy. The most common forms are B1, B6, and B12. Read up on the differences and benefits of each on our blog and start your journey toward increased energy. In case you hadn’t noticed, we love B12! And the reasons to admire it just keep coming. When you’ve got to know, we’ve got you covered. Having a baby is tough and looming legal complications aren’t doing you any favors. Our unobtrusive test satisfies legal requirements promptly and confidentially.